Yes; you can grow beautiful roses in the Northwest. Nita-Jo Rountree tells you how. 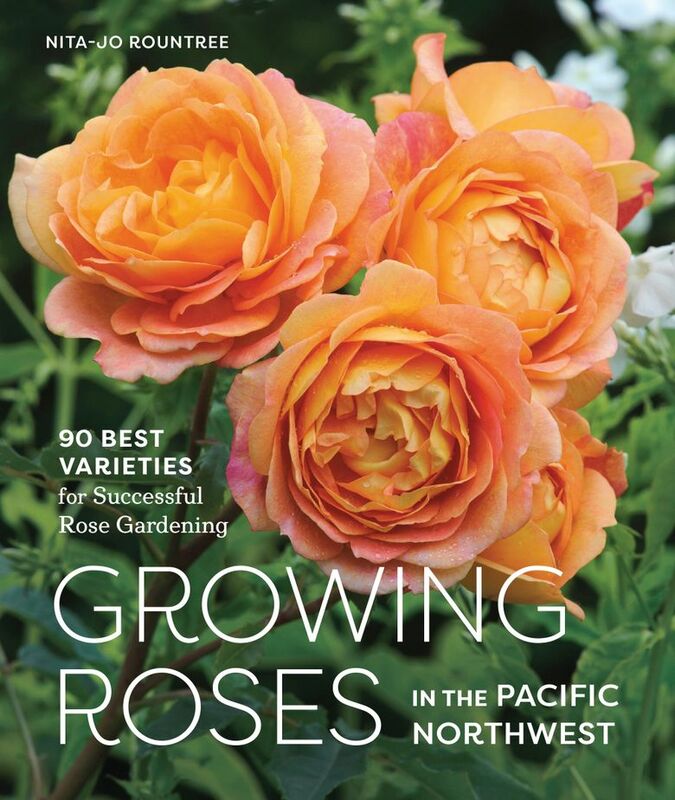 Her new book, “Growing Roses in the Pacific Northwest,” offers tips for those of us who aren’t experts. NITA-JO ROUNTREE’S enthusiasm for roses is infectious, and her Eastside garden a showplace of healthy, voluptuous rose blooms. She’s written a new book, published this month, packed with photos and advice on how to grow healthy roses in a climate so wet and cool that it encourages black-spot and other rose diseases. Not only does Rountree have plenty of dirt-gardening cred, but she’s also an advocate for organic solutions to meet rose-health challenges. In “Growing Roses in the Pacific Northwest” (Sasquatch Books, 2017, $19.95), Rountree demystifies roses. She believes you can grow just about any rose without much intervention if you choose wisely to begin with. Here is all the information you need to select the varieties best suited to the conditions your garden offers, with details on placement, soil, planting, pruning and watering. Nearly every page is drenched in rose photos, an extravaganza of silky, ruffled petals in shades from alabaster through deepest blood red. Add in thorns and fruit and stamen, and the book is one big seduction. Along with plenty of practicalities. For those of us who have no patience for fussing with roses, yet require them to be disease-free and flower profusely (in other words, the many gardeners who have given up, or nearly so, on growing roses), Rountree has some recommendations: Rosa ‘Darlow’s Enigma’, discovered in Oregon, is a hybrid musk that falls somewhere between a shrub and a rambler. It has ferny foliage and blooms prodigiously, and the single white flowers are wonderfully fragrant. 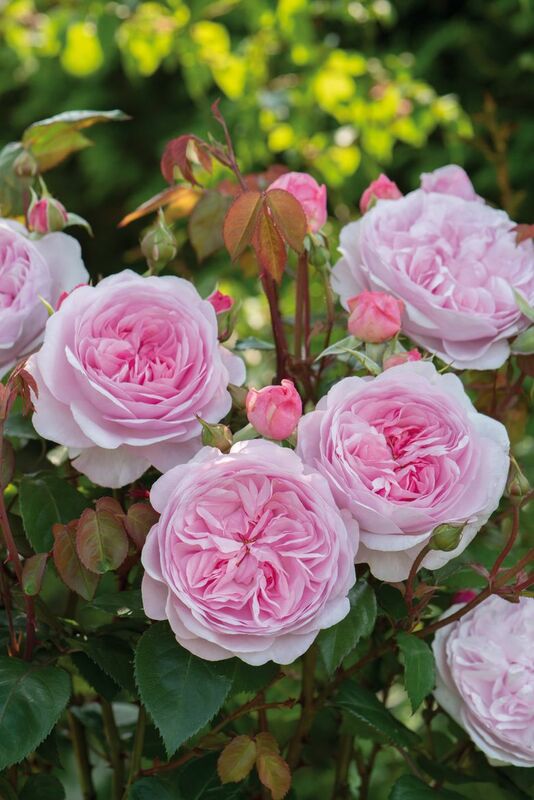 Another vigorous, disease-resistant, self-sufficient shrub rose is ‘Poseidon’, with cabernet-colored buds that open to frilly lavender blooms. This beauty is lightly scented, unlike the classic ‘Sally Holmes’, another do-gooder of a rose that is unfortunately fragrance-free. But Rountree says its pale apricot buds, followed by a profusion of open white flowers, make up for Sally’s lack of scent. Gardeners will appreciate the chapter on design. 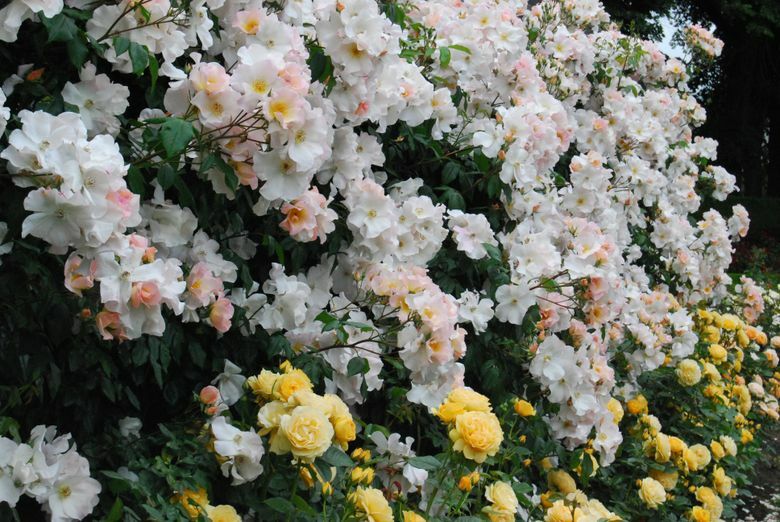 Rountree offers ideas from companion plantings to integrating roses into beds and borders. “I planted the golden-yellow grandiflora rose ‘South Africa’ last fall, and it partners beautifully with delphinium, then with salvia and rudbeckia from summer through fall,” she enthuses. 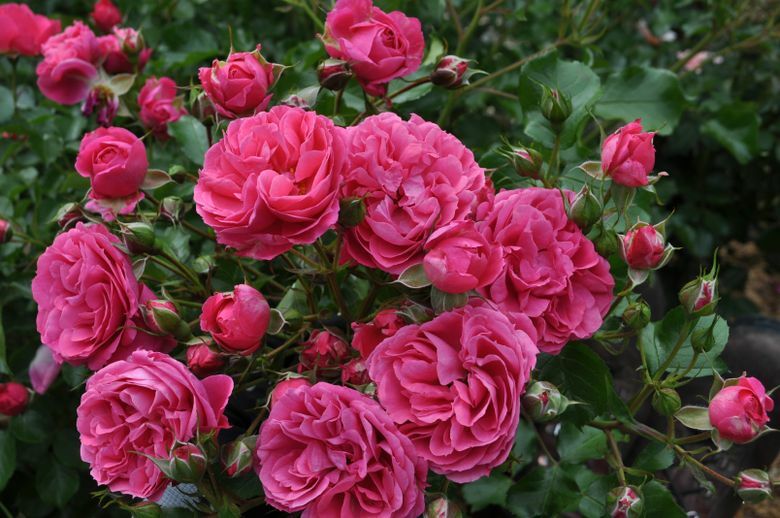 When it comes to containerized roses, the continuous bloomer ‘Pink Martini’ is totally disease-resistant and grows only 32 inches high by 24 inches wide. A more fragrant choice is Rosa ‘First Crush’ Parfuma, which is equally petite, and extravagantly scented with pale pink, ruffled blooms. Out of the more than 100 species of roses featured, including hybrid teas, climbers, ramblers, English roses, floribundas, grandifloras, hybrid musks, rugosas and species roses, Rountree has several personal favorites. “The newly introduced ‘Oliva Rose Austin’ has won my heart,” she says. She’s fallen for its fragrant, frilly, pure-pink (not a hint of salmon) flowers that bloomed nonstop its first year in her garden. And because red is her color of choice, Rountree loves Rosa ‘Braveheart’ for its velvety, dark-red flowers that are lightly fragrant and fully double. “No disease on either of these two,” she says happily. And how did Rountree become so obsessed with these most challenging and beloved of flowers?